We are witnessing the starving and the crippling of an entire generation. 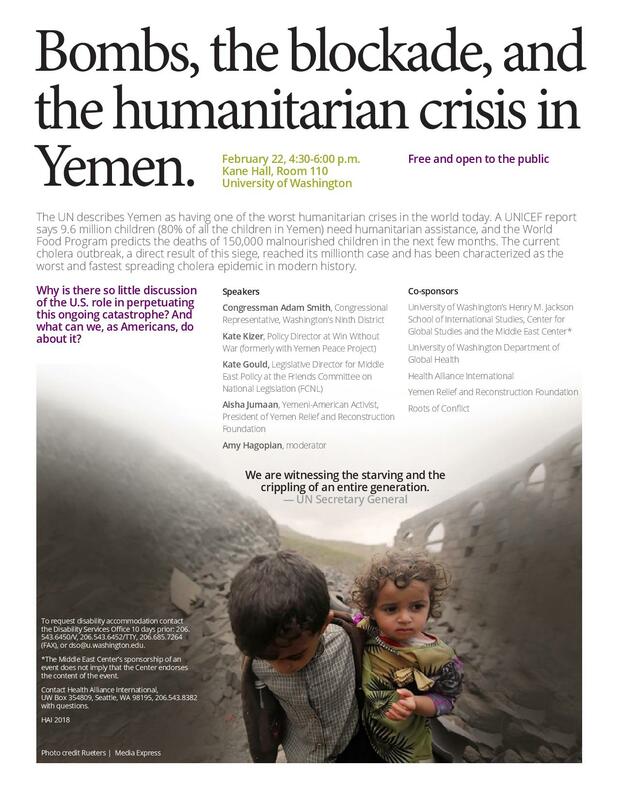 Why is there so little discussion of the U.S. role in perpetuating this ongoing catastrophe? And what can we, as Americans, do about it? U.S. Saudi Coalition: bringing peace or war? Conference: U.S. Saudi Coalition: bringing peace or war? Saudi Arabia has been, as of recent, making threats to wage war on Iran. Occupying Bahrain and helping crush the real, peaceful, people’s revolution there. Helping to remove the more progressive Arab leaders, such as Gaddafi in Libya, a country that is now in ruin and chaos. Utilizing that chaos to wage a proxy war on Syria, which seemingly is winding down, and major defeat for the Saudi front and its backers. And, waging war on the people of Yemen to suppress a revolution that was just starting to bloom – thus mixing war and revolution. Has Saudi Arabia been alone in these endeavors? Where from are this Saudi/Wahabi phenomenon? What of GCC countries relations with Saudis; how much collaboration and/or competition? Is Trump adding to longevity of these GCC regimes that are footprints of British-East-India company in the Persian Gulf? After World War One we had the October revolution. After World War Two we had myriad anti-colonial revolutions. After Vietnam, we had the Iranian revolution. Thus, it would seem that revolution(s) are to be expected, especially considering the scope and longevity of the current war. As wars lead to revolutions, ultimately, it is expected that revolution(s) may one day prevent war(s). Will this “unlimited war” be able to ebb the flow of revolution(s) that it seems to be more stimulating, now, than abating? Will revolution(s) be able to ultimately end war, especially in this case where an “infinite” and/or “unlimited” war has been announced? Within the confines of wars and revolutions, and humanity evermore facing survival or perdition; Saudi war mongering stands in stark contrast to Iran’s Islamic Revolution. Today, we will focus on Saudi wars, aggressions, and its relations with the West, in particular United Kingdom and United States that together have defined worlds’ biggest empire for last century. Click to visit this events page on facebook. For a flyer to the event click here.